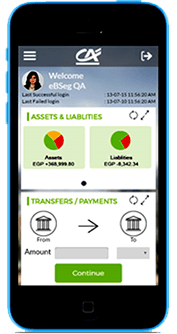 eBSEG Mobile banking solution offers a secure and rich UX application providing a world class banking and payment experience to your customers over a variety of mobile devices and platforms. eBSEG omnichannel solution integrates seamlessly and securely with your Back-end. 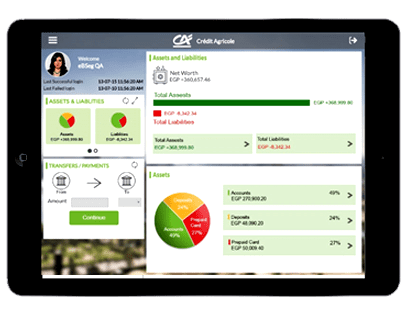 eBSEG Mobile banking solution offers a comprehensive suite of the latest banking services empowering banks to successfully deliver "any time" , "any where" banking services to customers on the GO. Bill payments Have never been this convenient, using Digital Banking Solution web and or mobile bill pay. Whether it’s one time payments, future payments or recurring payments, this feature makes it simple for your customers to pay bills, ANYtime, ANYwhere, while and on-the-go! 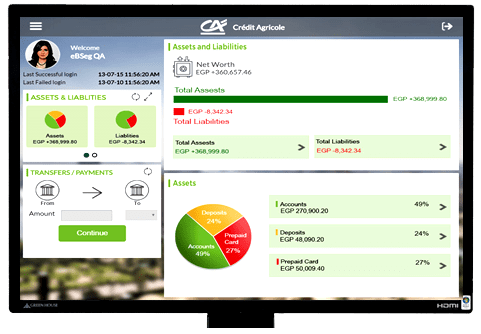 Enable your customers to access a variety of options about their bank accounts and so much more. Complete access to their transactional history alone most with complete details surrounding the transaction so they have comprehensive information at their fingertips. Whether it’s bank accounts, Credit Cards, Loans, Lines of credit or Bill payments, it’s available at their fingertips! Transfer money on-the-go, in a variety of ways using this feature. Its fast allows customers to transfer money, quickly and safely. Whether moving money between accounts, or by email, Digital Banking Solution has it covered, in an easy-to-use format that makes transferring money easy! Security is our first priority, with a state of art High Security Encryption communication Layer that makes it impossible to hack, to keep your customers secure. Quickly designate and update beneficiary information, ANYtime, ANYwhere! Whether your customers need to designate and update beneficiary information, need to know how to avoid legal disputes or simply want to safeguard confidential information, Digital Banking Solution provides it! Safe and secure, your customers information is in great hands and privacy is top of mind. In addition, customers can store and print the new changes! Manage every aspect of your Credit Cards with Digital Banking Solution, 24/7. Check account balances, available credit, transaction history, pay your credit card bill and so much more. You can also add credit cards to this view so you have them all in one tidy place! Manage your credit cards smartly, conveniently and securely, ANYtime, ANYwhere! Knowing where you have been is the best indicator of where you want to go. With the Digital Banking Solution transaction feature, customers can access their transactions history from any where. 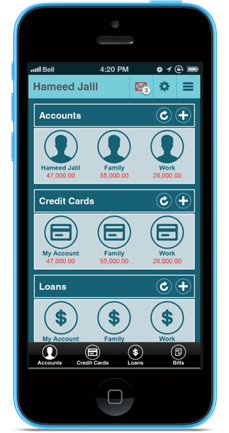 News and offers, Contacts FX rates, Currency Converter and calculators, integration with Social Networks Channels make this apps as bank marketing channel to engage customers ,build a deep relationship. The GPS integrated locator feature allows for immediate access to an ATM or branch office! Customers gain immediate access! It’s quick, easy to use and allows your customers to quickly search and discover your banks services, NOW! Notifications for accounts, Payment, funds transfer, balance notifications, cards notifications...etc. Why Digital Banking OmniChannel Portal? Implemented ALL channels within numerous major global financial institutions. Comprehensive set of insurance functions as per latest world standard. Flexible and robust technology design that can start small and grow with your business thus protects your investment.